A fruitful day at the Studebaker Archives. I did a lot today in South Bend! Got up and went to SASCO, drove around the perimeter of the former Studebaker manufacturing facility (where they're currently tearing down the remains of South Bend Lathe, which occupied a huge portion of the former Stude plant), found the Studebaker Administration Building, went to the Studebaker National Museum, and finally to the Studebaker Archive next door. I'd been told on the Forum that the archivist could look up the Sell Card for my car. Sell Cards were old IBM punch-cards that dealers filled out and mailed back to Corporate every time a new car was sold; they contained the Dealer name, salesman's name, trade-in, selling price, and... name and occupation of the buyer! I hoped that this would give me more insight on where my Lark came from. I buzzed at the door of the Archive building and was met by the Archivist, Andy Beckman. I gave him the VIN number of the car, and he said "Oh... 1963 is the least complete of all the years." He disappeared and came back a short time later with the bad news: a block of cards for about 8 VIN numbers - with mine smack in the middle - was missing. Andy apologized and I told him I'd hoped to come up with the buyer's name, having gotten the build sheet and found that the car was originally shipped to San Francisco. "Well," he said, "I could look in the Drive-Away Shipper reports. We could try and find the dealer's name that way." That lifted my spirits! Andy disappeared again and came back presently with a wispy slip of carbonless paper. "You have a Standard?" he asked. "Rose Mist with Chestnut interior, V-8, Flight-O-Matic and not much else?" I nodded and he showed me the slip: Barney had been a California car from the beginning, delivered and sold by Waters Studebaker, 1701 Van Ness Avenue, in San Francisco. Thanks to Andy, I'm one step closer to finding out who had Barney when he was new. If you want to do this sort of research on your Studebaker, you don't have to do it in person - call the Archives and ask for help. The number is 574-235-9983. Greetings from South Bend, Indiana! Here I am in downtown South Bend! I added an extra day to a business trip and came to make a pilgrimage to the Studebaker National Museum, and then to SASCO. It was about a 4 hour drive from Cleveland to get here yesterday, along I-80, the Ohio Turnpike. It reminded me a lot of driving I-5 through central California -- lots of farms, very few people. Just substitute corn fields for almond groves. The window of my Holiday Inn room looks out on the scene to the left, apparently the city hall / courthouse complex. With an actual, lighted courthouse clock! In the distance I can see the Norfolk Southern moving through town on an elevated right-of-way; nearby are several very old stone churches surrounded by cool old Craftsman-style homes. Amplification: turns out that elevated rail line is the remnants of the NYC route that once served the Studebaker plant. It runs immediately adjacent to the now unused South Bend Union Station and the former Studebaker Administration Building. More to come! 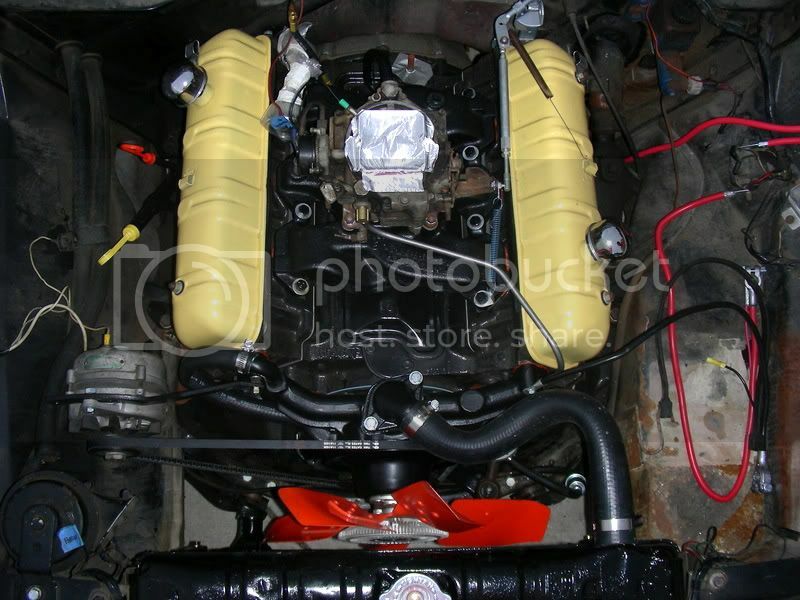 Got a lot done yesterday despite some ongoing physical discomfort... fuel pump, fuel filter and hard line to the carburetor are in; genuine Studebaker Viscous Drive clutch fan bolted on, freshly recored radiator installed and upper hose on... not much left to do now. Things are getting done now at a pretty good clip. The last couple of weeks, I've been messing around on the car as much as possible - an hour here, a lunch break there. Parts have come trickling in from all sources, too. A couple of days ago, I got a new PCV valve from NAPA and installed that; the pre-assembled water manifold (with pump, thermostat and water neck) and alternator went on last Saturday. Today my fuel pump arrived from Studebakers West and I made another trip to NAPA for fuel line fittings (a right angle was needed for the output of the fuel pump and the carb inlet). I got new throttle and transmission control swivels from Chuck Collins, which still need to go on. I also replaced the old, clogged Zerk fittings on the driveshaft and got a needle adapter to lube it up, since they're at such weird angles. The driveshaft is ready to go in now. 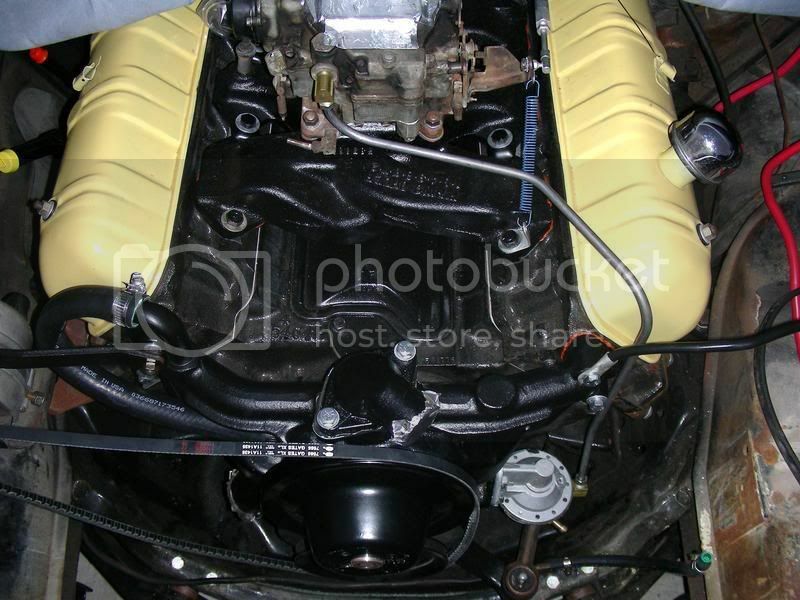 Last steps are to get the transmission shifter rod and new throttle pressure rod connected, install the radiator and clutch fan, and get lube in her. We're almost ready for Firing Day!